To recap, in part 1 I introduced the Refined Rustic look, explaining why this style is so popular, whilst providing some more general design tips. And, in part 2, we discovered how to replicate the look in a cloakroom or small bathroom space. Why not head back to part 1 (if you haven’t done so already) and read through? If you’re seeking a style that incorporates bright, bold colours and fancy patterns… well, this isn’t it. 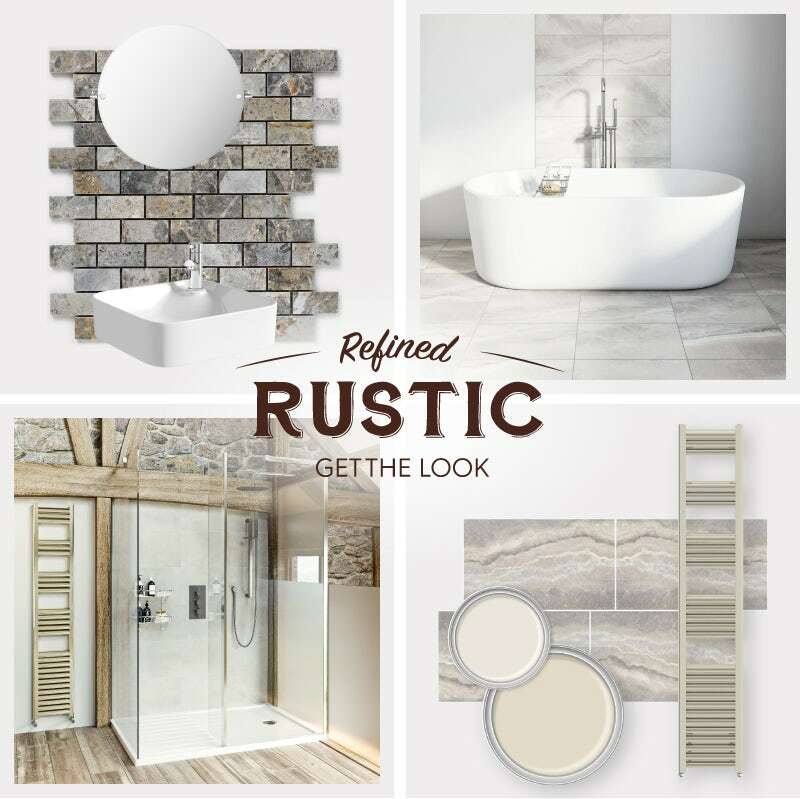 Maintaining the rural charm of your property and being sympathetic to its original features are key elements of the Refined Rustic look, which calls for a more conservative approach. To achieve a clean, refined look that sits perfectly alongside the rustic surfaces and textures of your property, your base colour will need to be white. However, you can be slightly more creative and opt for a shade that contains a hint of beige, brown or grey, depending on your own personal preference. A neutral palette can be used to add accent shades to your colour scheme (as seen within the mosaic tiles), however, the natural wood and stone finishes within your room should do much of the job for you. One of the main reasons why this look is perfect for a renovated property is the fact that it makes a feature of all the original and rustic elements within your room. Exposed wooden beams are one of the most charming features of any cottage, farmhouse or barn renovation, adding real character to the overall feel of your decor. Therefore, it is wise to choose furniture and accessories that complement the original wood in your home. Weathered wood finishes, like oak, pine or walnut, are great for cabinets, vanity units and countertops, whilst wicker, bamboo or faux wood materials like rattan, look superb when picking out accessories. Another natural material that is a common feature of rustic properties is stone. Whether you're lucky enough to have gorgeous rough stone walls or simple a few stone embellishments here and there, it's a good idea to pick out some products which complement these in terms of colouring and shade. Stone effect tiles are a great example, as you'll discover below. Depending on the composition of your room, stone and wood finishes will complement the original features in your property. 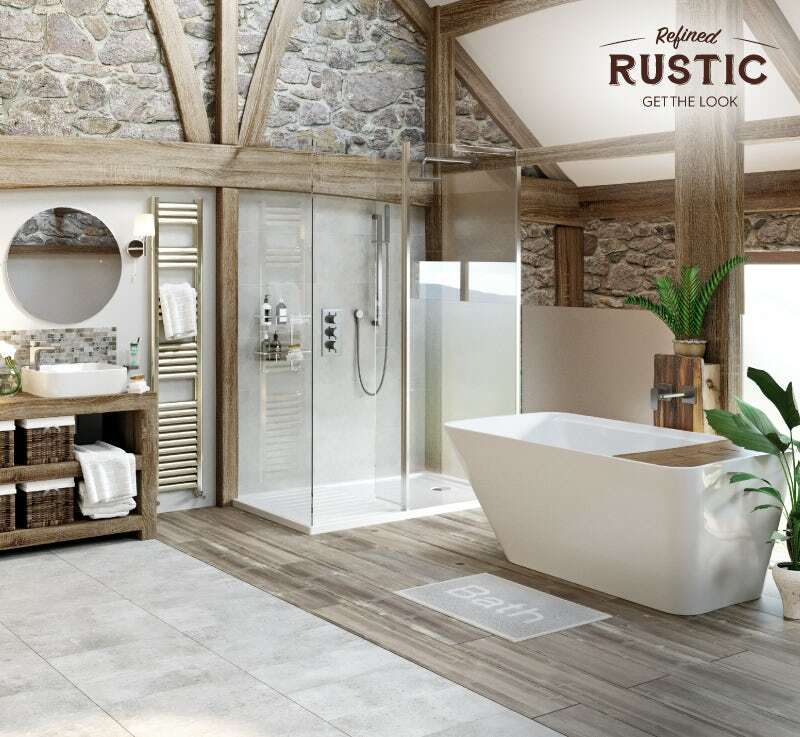 However, natural stone can be expensive and difficult to use, whilst wood isn’t always suitable for the damp and humid environment that a bathroom presents, so we would recommend looking for alternatives that are more suited to bathroom use. Your choice of flooring is incredibly important, as it will set the tone for the rest of your decor. In our room set, we’ve gone for a mixture of tiles and vinyl flooring. We selected [grey stone effect tiles] that complement our walls, whilst the vinyl flooring really does give the appearance of wood, with a surface that won’t warp, crack or require regular maintenance. Where the walls don’t contain stone (for example, internal or stud partition walls), we’ve either simply painted a warm shade of white or, in the case of the shower enclosure, used shower wall panels in a similar shade. To provide added protection around the basin area, we have created a splashback using a neutral mosaic tile. 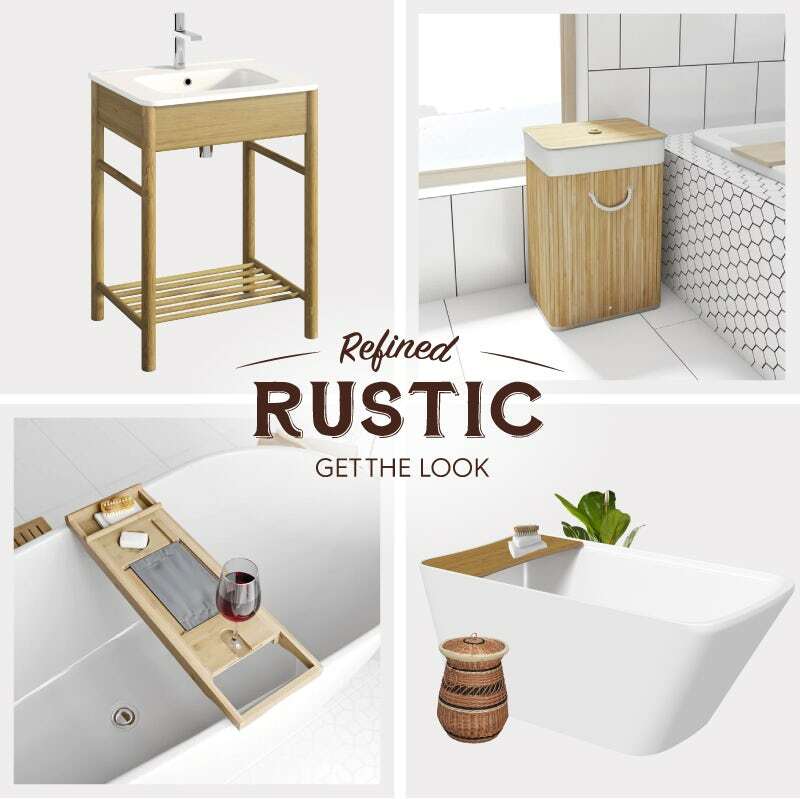 In part 4, I’ll be showing you exactly which products to choose to achieve the Refined Rustic look. Click on the banner below for your final inspirational instalment. 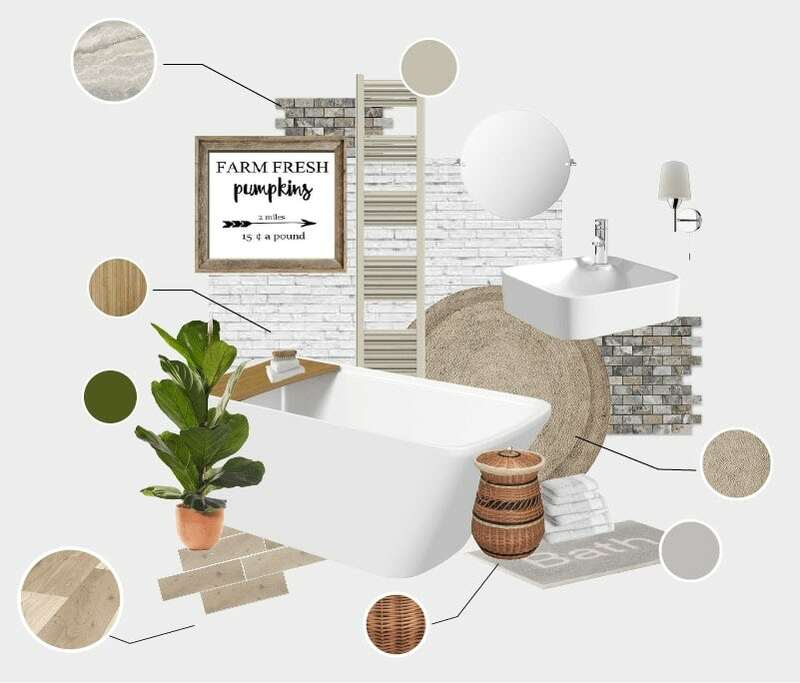 In the fourth and final instalment of this style guide, we'll be showing you exactly which products to use for your rural bathroom renovation. 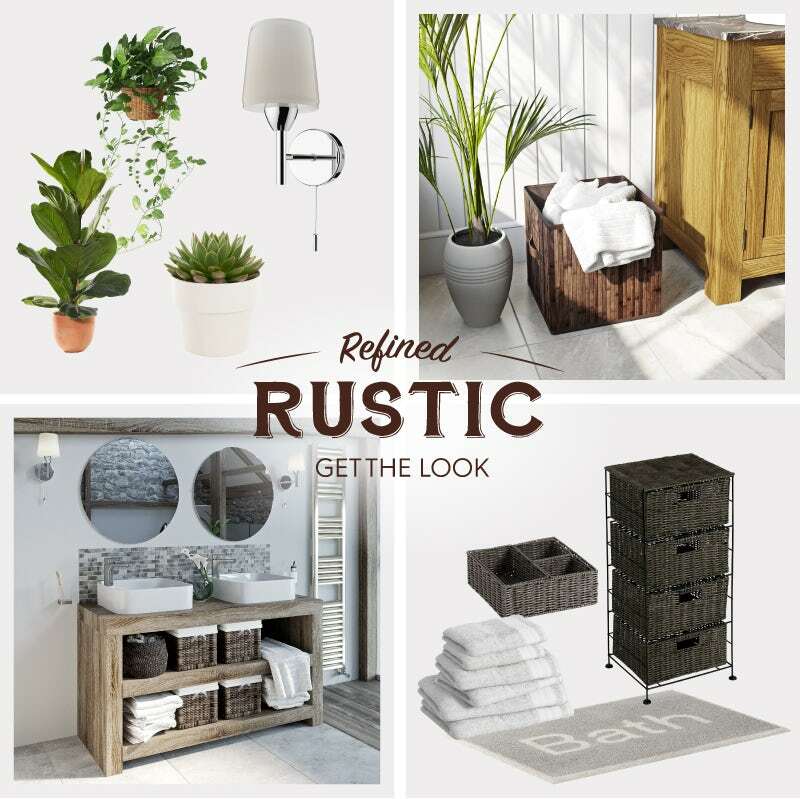 Get the Refined Rustic look.